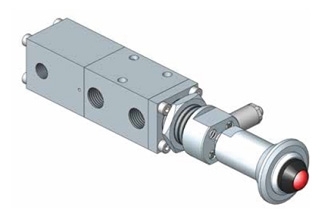 Midland-ACS 3/2 pad (to pull) spring return with pilot and manual latch and visual indicator spool valves in stainless steel for use on gases. The visual indicator will show RED when the valve is closed. The valve is operated by pulling out the pad - the latch pin when pressed while releasing the pad will hold the valve in the open position - the visual indicator will still show RED. When a pilot signal is applied the latch pin is released and the visual indicator will show GREEN - on loss of the pilot signal the valve closes and the visual indicator will show RED - reintroduction of the pilot signal will not operate the valve.